Cape Town - Anyone who believes there’s a quick fix for South Africa’s political and financial malaise when President Jacob Zuma leaves office needs to think again. His successor will inherit an economy that slid into recession in the first quarter, mismanaged state companies that are bleeding cash and a network of officials implicated in looting taxpayer funds. Efforts to reignite growth and rein in a 27.7% unemployment rate will be hamstrung by Treasury’s commitment to curb public debt, which has more than tripled to R2trn since Zuma came to power eight years ago. Zuma’s second and final term as president is due to end in 2019, but his political clout is waning as he prepares to relinquish the leadership of the ANC in December and, depending on who replaces him, he could be forced to step down early. Most investors are rooting for Deputy President Cyril Ramaphosa, a former labour union leader who helped draft the Constitution and made a fortune in business. His main rival is Nkosazana Dlamini-Zuma, the former chairperson of the African Union Commission and Zuma’s ex-wife. 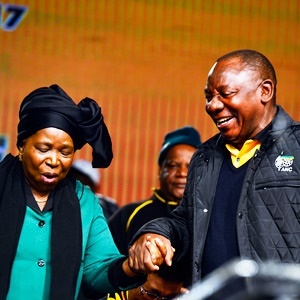 On the campaign trail, Ramaphosa has emphasised the need for economic growth, while Dlamini-Zuma has echoed Zuma’s calls for “radical economic transformation” to address racially based income disparities that date back to white-minority rule. Whoever wins has to halt the plunder of state resources, according to Pravin Gordhan, who Zuma fired as finance minister in March in a move that prompted two ratings companies to downgrade South Africa’s foreign-currency debt to junk. “You can talk about radical this or radical that, it doesn’t really matter. Every single day that we allow the current trajectory to continue, there is huge damage that is caused,” Gordhan said in a panel discussion in Cape Town this month. With a different leadership approach “we can turn this country around in six months, not in terms of achieving 5% growth, but building a platform on which that process can actually begin,” he said. The Reserve Bank expects the economy to expand 0.5% this year and 1.2% in 2018. Zuma’s successor could lift the growth rate to 3% within two years by bolstering investor confidence and addressing regulatory uncertainty, but the state will have little scope to provide stimulus itself, according to Lumkile Monde, an economics lecturer at the University of Witwatersrand in Johannesburg. Weaker-than-expected economic growth is likely to curb tax revenue this year, making it difficult for Treasury to meet its target of slashing the budget gap to less than 3% of gross domestic product. After having raised tax rates for two of the last three years, the government may have to lower spending to stop the deficit from widening. Scandals, policy missteps and controversial appointments have been the hallmarks of Zuma’s tenure and caused deep divisions within the ruling African National Congress. Former Public Protector Thuli Madonsela alleged in her State of Capture report in November 2016 that he allowed members of the wealthy Gupta family, who are in business with his son, to influence Cabinet appointments and the award of state contracts. And a study released in March by a team of academics concluded that Zuma, the Guptas and their allies had orchestrated “a silent coup,” securing control over key positions in the state, enabling them to allegedly steal billions of rand. Zuma and the Guptas deny wrongdoing. Eskom and Transnet are among state companies that have been caught up in the scandal. Reports by Madonsela and the academics implicated some of their top management and board members in aiding the alleged looting. Both companies have said they are investigating the accusations. South Africa must undertake major structural reforms, including imposing greater fiscal discipline, selling inefficient state companies and shrinking the state’s role in the economy if it’s to put itself back on track, according to Steve Hanke, a professor of applied economics at Johns Hopkins University in Baltimore.